From bold prints to solid colours, Milan Fashion Week had an interesting mix of hot trends and we are obsessed with some of them. With a number of designers showcasing their latest spring/summer 2019 collection at Milan Fashion Week, an entire bunch of trends stood out; some fun and quirky, the rest classy and sophisticated. Here is a list of the top trends that are sure to spruce up your wedding wardrobe. Aside from mainstream prints such as floral and stripes to animal prints and ink spills, this fashion week was all about interesting prints that would make a statement. Different patterns, prints, and silhouettes layered with each other dominated the runway. 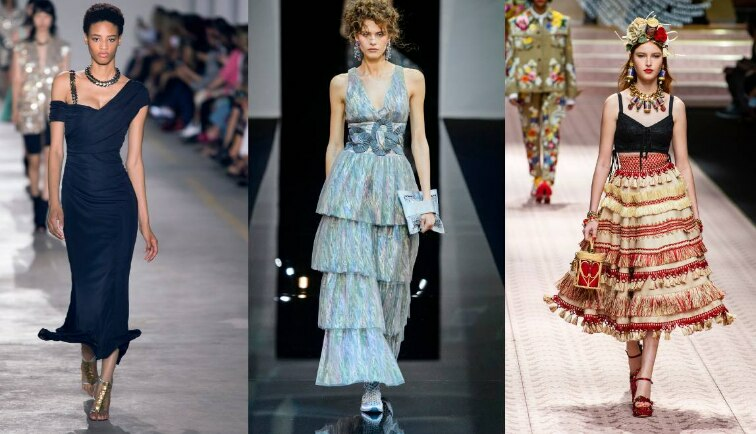 Well known designers such as Missoni to upcoming ones such as Matling and Daisy Shely embraced this trend. Leather was used extensively in the form of structural skirts, dresses, and layers to make a statement or give an otherwise boring outfit a fun spin. What was really interesting was the use of innovative tailoring techniques in some of the leather dresses. Bold, bold hues such as blue, red, and yellow were spotted a lot on the runway. Continuing with the theme of impactful pieces, embellishments were extremely popular on the runway. From girly florals to rock chic metallics, designers made sure to use embellishments which would suit everyone's personal style. The Milan Fashion Week was all about using one piece of standout element in terms of colour, cloth, and texture, that would make a bold statement. If I were to use two words to describe the trends at Milan Fashion Week, they would be minimal yet impactful.